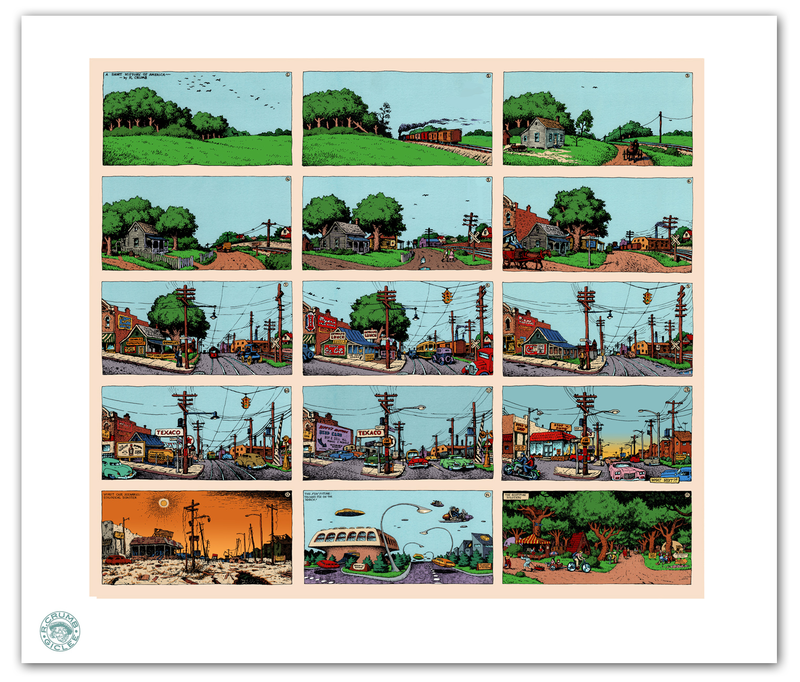 I scanned the 1992 serigraph and spent weeks cleaning it up, brightening up some colors in Photoshop as I knew Crumb considered the original serigraph edition too dark. I printed it out and sent it to Crumb for his approval. He had many color changes! All the trees and grass in each panel needed to be lightened. Certain cars had to have a certain color–"Turquoise was a popular color for Studebaker in those years," according to Crumb. And many other color changes per his historical color sense were requested. It took me over 70 hours to finish the job. While I was on the phone with RC, I pointed out one of the details in the image, and said, "I've often wondered if you took this image from multiple historical photographs, or if you drew this from your imagination. This detail is so realistic, I have to think you found some photographs and based these panels off of them." Crumb answered, "I drew that image entirely from my imagination. I wish I had found some photos, it would have been more accurate. For example, one mistake I made was with the railroad crossing signs. The real signs have "crossing" on one board, and the "rail" and the "road" broken up on the sign behind. I mistakenly flip-flopped 'em and broke up the word "crossing."